KIEV, Ukraine -- Ukraine will hold a referendum on joining NATO once it has met certain criteria for membership, President Petro Poroshenko has said. 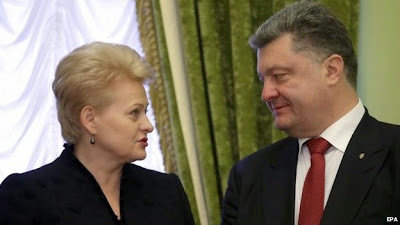 Lithuania's president (L) is the latest leader to offer military assistance to Petro Poroshenko. At a joint news conference with Lithuania's president, Mr Poroshenko said he had "worked out the criteria", but gave no further details. Last week, a Kremlin official called for "a 100% guarantee" that Ukraine would not think about joining NATO. Ukraine has been fighting pro-Russian separatists for most of the year. Mr Poroshenko did not say what the criteria for Ukraine's membership were. NATO itself says: "There is no fixed or rigid list of criteria for inviting new member states to join the alliance." However, countries are only admitted to NATO if it believes they will "contribute to security and stability in the North Atlantic area". Analysts say Ukraine, destabilised by the fighting, is therefore unlikely to be seen as viable by NATO. President Vladimir Putin's spokesman Dmitry Peskov has accused NATO of breaking a historic promise by gradually approaching Russia's borders. He told the BBC that the alliance was attempting to break the "balance of power". Three countries from the former Soviet bloc joined NATO in 1999, followed by several more in 2004, including Lithuania and the other Baltic states. Meanwhile President Putin has signed a deal with the leader of Abkhazia, Raul Hadzhimba, which will reportedly see Russia invest $260m (£166m; 209m euros) in Georgia's breakaway region by the end of 2017. The strategic partnership agreement will also create joint Russian and Abkhazian military forces, according to the Associated Press. It comes days after tens of thousands of people took part in a rally organised by Georgia's main opposition party, the United National Movement, against the deal. Abkhazia declared independence in 1999 following a separatist war. In 2008, Russia formally recognised the province's autonomy. On Monday, Lithuania joined other NATO members in offering military assistance to Ukraine. It is not clear whether the aid President Dalia Grybauskaite has offered will include lethal equipment. Fighting has continued in east Ukraine despite both sides signing a cease-fire agreement on 5 September. In the eight weeks since the Minsk agreement was signed, almost 1,000 people have been killed, the UN human rights office says. Three Ukrainian soldiers have been added to this toll in the past 24 hours, while reports have come in of heavy shelling in Donetsk. Since the conflict began in April, more than 4,300 people have died and almost one million have been displaced, the UN has said.